Complete control of your benefits! Never hassle with your dental insurance company again! Low monthly or yearly payments. You decide! Freedom to choose your treatment plan! No more estimates! Get exact pricing! Never get denied coverage again! Never put off dental emergencies again! 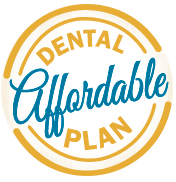 The Affordable Dental Plan (ADP) is an annual reduced-fee savings plan for families and individuals that allows all ADP Members to receive quality dental services at greatly reduced prices. Unlike conventional insurance plans, with ADP there are no deductibles, no yearly maximums, and no waiting periods to begin treatment. ADP benefits coverage begins immediately on plan registration. Membership is $25/month for the first family member and $20/month for each additional family member. Or pay for the year and save more ($250 for first member, $200 for each additional member) Eligible family members include spouse and dependent children under the age of 23. Plan duration is for one year from the registration date. Benefits are for services rendered at the office of John G. Rutland, DMD, FAGD– Family and Cosmetic Dentistry.